After last Sunday’s 7.2 quake hit 100 miles east of our house, we were glad to gather together with friends for a comfort-food supper. My pal Jan brought a pineapple soufflé, a traditional Midwestern dish, to pair with the Easter ham and creamy horseradish sauce. We decided to rename her recipe: “Easter Earthquake Pineapple Soufflé”. It is more of a bread pudding, in my opinion, but I never argue with anyone from North Dakota. I have cut the butter and sugar and played with some of the ingredients. Canned fruit works fine, as long as you buy the pineapple packed in its own juice. Don’t knock this until you try it! 2. Cream butter and sugar together in mixer. Add eggs one at a time. Drain and add pineapple. Add cubed brioche, salt and cayenne. Mix well. 3. 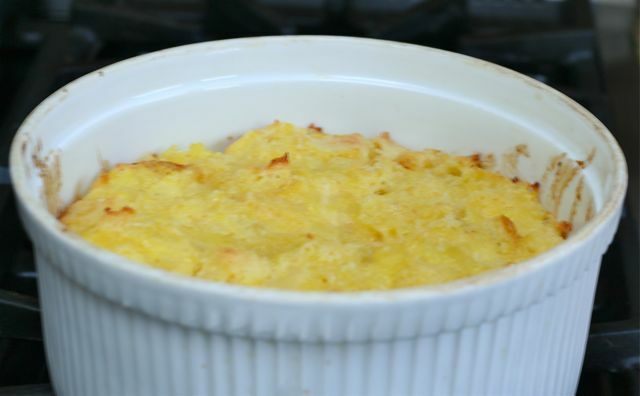 Spoon into buttered soufflé dish and bake 45-50 minutes, or until top has lightly browned.